Stalinism is the name given to the political and economic system which Joseph Stalin implemented in the Soviet Union between 1934 and 1953, while he was General Secretary of the Central Committee of the Communist Party of the Soviet Union. It includes a command economy, an extensive use of propaganda to establish a personality cult around an absolute dictator, and the use of the secret police to maintain social submission. The term "Stalinism" was coined by Lazar Kaganovich. Although he tolerated the use of the term by associates and was never used by Joseph Stalin, who described himself as a Marxist-Leninist and a "pupil of Lenin." Like many other "-isms" it can be used as a pejorative term when referring to nation-states, political parties, or the ideological stance(s) of individuals, particularly "Anti-Revisionists" who maintain that the Soviet Union successfully implemented Marxism-Leninism during Stalin’s regime. It is also used as a pejorative to describe politicians and political groups, Communist or non-Communist, who are perceived as particularly authoritarian or hard-line. Stalinism has been described as being synonymous with totalitarianism, or a tyrannical regime. The term has been used to describe regimes that fight political dissent through violence, terror, imprisonment, and killings. "Stalinism" refers to a style of government, rather than a political ideology. The term "Stalinism" is used by anti-communists, communists (left communists, trotskyists, luxemburgists, council communists), and even pro-Stalin Marxist-Leninists themselves to denote the brand of communism that dominated the Soviet Union, and the countries within the Soviet sphere of influence, during the leadership of Joseph Stalin. The term used in the Soviet Union and by most who uphold its legacy, however, is "Marxism-Leninism." Stalin was not an original theoretician, but an able communicator who wrote several books easily understood by the public, and prided himself on maintaining the legacy of Lenin as a founding father for the Soviet Union and the future Socialist world. Stalinism claimed to apply the ideas of Marx and Lenin in ways appropriate to the changing needs of society, such as the transition from "socialism at a snail's pace" in the mid-twenties to the rapid industrialization of the Five-Year Plans. Occasionally, the compound terms "Marxism-Leninism-Stalinism" (used by the Brazilian MR-8), or teachings of Marx/Engels/Lenin/Stalin, are used to imply an alleged heritage and succession. However, many people professing Marxism or Leninism view Stalinism as a perversion of their ideas; Trotskyists, in particular, are virulently anti-Stalinist, considering Stalinism a counter-revolutionary policy which used Marxism to achieve power. From 1917 to 1924, Lenin, Trotsky, and Stalin often appeared united, but, in fact, their ideological differences never disappeared. In his dispute with Trotsky, Stalin de-emphasized the role of workers in advanced capitalist countries (for example, he postulated theses which labeled the working class in the United States as a “bourgeoisified labor aristocracy”). Also, Stalin disagreed with Trotsky over the role of peasants, such as in the revolution in China, where Trotsky favored urban insurrection over peasant-based guerrilla warfare. Socialism in One Country, a focus on establishing a successful Marxist society in one country (the Soviet Union) rather than theorizing about world revolution. The theory of aggravation of the class struggle along with the development of socialism, a theoretical base supporting the repression of political opponents as necessary. Stalin established himself as the supreme leader of Russia, eliminating anyone who openly criticized him or opposed his policies and using the Cheka, the police, the military and his intelligence organization to ensure that no person succeeded in questioning his authority. In February 1956, in his "Secret Speech," On the Personality Cult and its Consequences, delivered to a closed session of the Twentieth Party Congress of the Communist Party of the Soviet Union, Khrushchev denounced Stalin for his cult of personality, and his regime for "violation of Leninist norms of legality." Stalin's immediate successors, however, continued to follow the basic principles of Stalin's rule; the political monopoly of the Communist Party presiding over a command economy, and a security service able to suppress dissent. This model has been followed in numerous communist regimes and modern dictatorships, including those of Cuba and North Korea. The theory of aggravation of the class struggle along with the development of socialism, which became one of the cornerstones of Stalinism in the internal politics of the Soviet Union, was put forward by Joseph Stalin in 1933. Stalin argued that as the country advanced towards realizing the ideal of socialism, the struggle of the doomed remnants of the exploitive classes against socialism would become more and more acute. Therefore, political repression was necessary to prevent them from succeeding in their presumed goal of destroying the Soviet Union. Stalin believed that the class enemy could even worm its way into the party leading a socialist state. He evaluated his associates according to whether or not they acted on the belief that there could be enemies inside the Party. Stalin labeled tolerance inside the Party to those who disagreed with the official Party line as "rotten liberalism," and claimed that such tolerance would weaken the Party and eventually lead to its destruction, making occasional purges necessary. Mao Zedong developed Stalin's idea further, saying that there is an entire bourgeoisie inside the Communist Party, leading a socialist state before the establishment of communism. While Stalin regarded enemies within the party as Western agents, Mao proposed that the enemy was a domestic bourgeoisie which aimed at the restoration of capitalism. Mao held that the restoration of capitalism could happen from within, without war, if there were an ebb in the class struggle. Upon the death of Mao, Hua Guofeng and Deng Xiaoping rejected his theory of the "bourgeoisie in the party." At the end of the 1920s, Stalin launched a wave of radical economic policies which completely overhauled the industrial and agricultural face of the Soviet Union. This came to be known as the 'Great Turn', as Russia turned away from the near-capitalist New Economic Policy (NEP) which had been implemented by Lenin following seven years of war (1914-1921, WWI from 1914 to 1917, and the subsequent Civil War), in order to ensure the survival of the Communist state, and which had rebuilt Soviet production to its 1913 levels. Russia still lagged far behind the West, and Stalin and the majority of the Communist party felt that the New Economic Policy was not only compromising Communist ideals, but was not producing satisfactory economic performance or contributing to the creation of the envisaged Socialist society. In order to make Russia a global power, it was necessary to increase the pace of industrialization and catch up with the West. Russia was essentially still based upon a backward agrarian economy, while her Western capitalist rivals were fully industrialized, making Russia vulnerable to attack. The lack of any natural boundaries (other than the great distances involved), as well as the extremely long border, meant that in the event of invasion, any attacking force could rapidly converge upon the comparatively small industrial center focused around Moscow. It was therefore necessary to establish an eastern industrial base, beyond the Urals, that could continue the Soviet war effort in event of Moscow's capture. It was also necessary to establish industry capable of producing armaments of sufficient quantity and quality to fight a modern war. Russia had to rely on expensive imports for industrially manufactured goods, especially the heavy industrial plant required for industrial production. The USSR required its own industrial base to produce goods for its own people, but in order to acquire the foreign currency with which to buy the basis of an industrialized economy as well as the initial raw materials needed to fuel it, surplus grain would be required for export. This necessitated an increase in grain production, and made industrialization dependant on the work of the peasants. A poor harvest meant that industrialization could not go ahead, since the peasants required grain to support themselves and the burgeoning urban population, and only surplus grain was available for export. Stalin made use of the collectivization of agriculture to take control of agricultural production in order to finance the drive towards industrialization. The process of collectivization was not a peaceful one, and Stalin dealt harshly with the resistance of the peasants and the wealthy rural farmers ("kulaks"). According to Marxist theory, Socialism could only exist in a highly industrialized state, where the overwhelming majority of the population were workers. However, in 1928 approximately 20 percent of the Russian population were industrial workers. Stalin wanted to prove the Socialist system to be at least the equal of the capitalism in living standards as well as industrial output, and present Communism as a viable alternative to any capitalist form of government. He also wanted to prove himself as Lenin's equal and successor, and believed that an economic transformation of the USSR would establish him as a leader of great importance. Stalin instituted a series of three centrally-mandated “Five-Year Plans” which massively expanded the Soviet economy. The consumption of ordinary Soviet citizens was severely restricted and agricultural production and private wealth were appropriated to provide capital for investment in industry. Large increases occurred in the production of many sectors, especially in coal, pig iron and steel production. According to some statistical measurements, within thirty years key industrial areas made great strides in catching up with the West. Some economic historians now believe it to be the fastest economic growth rate ever achieved. Official Soviet estimates placed it at 13.9 percent, Russian and Western estimates gave lower figures of 5.8 percent and even 2.9 percent. The accompanying social costs and long term economic consequences make the actual success of this effort debatable. Confiscations of grain and other food by the Soviet authorities under Stalin’s orders contributed to a famine between 1932 and 1934, especially in the key agricultural regions of the Soviet Union, Ukraine, Kazakhstan, and North Caucasus that may have resulted in millions of deaths. In 1933, worker's real earnings sank to about one-tenth of the 1926 level. Industries made use of the unpaid labor of both common and political prisoners in labor camps, and communists and Komsomol members were frequently “mobilized” to work on various construction projects. Because of the apparent prestige and influence of the successful Russian revolution, many revolutionary regimes and post-colonial states in the developing world throughout the twentieth century viewed the politico-economic model developed in the USSR as an attractive alternative to the existing "market economy" systems, and took steps to follow the USSR's example. Forced collectivization of agriculture was intended to increase agricultural output by integrating smaller private farms into large-scale mechanized farms, bringing the peasantry under more direct political control, and making tax collection more efficient. Collectivization brought about drastic social changes, on a scale not seen since the abolition of serfdom in 1861, and relieved the peasants of control over the land and its produce. Almost everything, including land, farming equipment, livestock, and residences, was owned by the state. This inevitably led to a drastic drop in living standards for many peasants, and caused violent reaction among the peasantry that was heavily suppressed by Red Army, the State Political Directorate (OGPU) and the Komsomol. In the first years of collectivization, it was estimated that industrial and agricultural production would rise by 200 percent and 50 percent, respectively; however, agricultural production actually dropped. Stalin blamed this unanticipated failure on peasants who resisted collectivization, labeling them “kulaks” (rich peasants), and punishing them by execution, exile, or confinement in Gulag labor camps. Many historians assert that the disruption in agriculture caused by collectivization was largely responsible for major famines. After Stalin's death in 1953, his successor Nikita Khrushchev repudiated his policies, condemned Stalin's cult of personality in his Secret Speech to the Twentieth Party Congress in 1956, and instituted destalinization and liberalization (within the same political framework). Consequently, most of the world's Communist parties, who had previously adhered to Stalinism, abandoned it and, to a greater or lesser degree, adopted the moderately reformist positions of Khruschchev. The notable exceptions were North Korea under Kim Il-sung and the People's Republic of China, under Mao Zedong. Kim simply purged the North Korean Communist party of de-Stalinization advocates, either executing them or forcing them into exile or labor camps. Under Mao, the People's Republic grew antagonistic towards the new Soviet leadership's "revisionism," resulting in the Sino-Soviet Split in 1960. Subsequently, China independently pursued the ideology of Maoism, which still largely supported the legacy of Stalin and his policies. Albania took the Chinese party's side in the Sino-Soviet Split and remained committed, at least theoretically, to its brand of Stalinism for decades thereafter, under the leadership of Enver Hoxha. The ouster of Khruschev in 1964 by his former party-state allies has been described as a Stalinist restoration, epitomized by the Brezhnev Doctrine and the apparatchik/nomenklatura "stability of cadres," lasting until the hyper-revisionist Gorbachev period of glasnost and perestroika in the late 1980s and the fall of Soviet communism itself. Some historians draw parallels between Stalinism and the economic policy of Tsar Peter the Great. Both men desperately wanted Russia to catch up to the western European states. Both succeeded to an extent, turning Russia temporarily into Europe's leading power. Others compare Stalin with Ivan IV of Russia, with his policies of oprichnina and restriction of the liberties of common people. Trotskyists argue that the "Stalinist USSR" was not socialist (and certainly not communist), but a bureaucratized degenerated workers' state—that is, a non-capitalist state in which exploitation is controlled by a ruling caste which, although not owning the means of production and not constituting a social class in its own right, accrues benefits and privileges at the expense of the working class. Left communist theorists like CLR James and the Italian autonomists, as well as unorthodox Trotskyists like Tony Cliff have described Stalinism as state capitalism, a form of capitalism where the state takes the role of capital. Milovan Đilas argues that a New Class arose under Stalinism, a theory also put forward by various liberal theorists. Some in the Third Camp use bureaucratic collectivism as a theory to critique Stalinist forms of government. The relationship between Stalinism and Leninism is disputed. "Continuity theorists" believe that Stalinism was the logical outcome of Leninism, and that there are more similarities than differences between the two. Others argue that Stalinism marked a fundamental break with the legacy of Lenin and Marxism-Leninism as practiced up to that point. According to this theory, Lenin’s policies developed a totalitarian regime, which was later radicalized by Stalin. Supporters of the view that Stalinism emerged from Leninism point to a number of areas of alleged continuity of Lenin’s legacy during Stalin’s regime. For example, Lenin put a ban on factions within the Communist Party and introduced the one-party state in 1921, a move that enabled Stalin to easily get rid of his rivals after Lenin's death. Moreover, Lenin frequently purged his party of “unfaithful” Communists, a method used extensively by Stalin during the 1930s to eliminate his opponents. Under Lenin’s rule, terror was used to suppress opposition. For that function the Cheka was set up in December 1917. Felix Dzerzhinsky, its leader, exclaimed with some enthusiasm: “We stand for organized terror – this should be frankly stated.” Western authorities estimate that by 1924 the Cheka had executed more than 250,000 people. The number of labour camps increased from 80 in 1919 to 315 by 1923. The radical methods of Stalin’s modernization program were a further development of Lenin’s war communism, which was characterized by extensive nationalization, the forceful collection of grain from the countryside and strict control of labor in which all workers were subjected to army-style discipline. All those features became part of Stalin’s economic policy. Lenin appointed Stalin to the key position of [[General Secretary of the Communist Party of the Soviet Union|general secretary]], which gave him the power to appoint, dismiss or promote party members on all levels and thus build a base of political power. The dictatorial government established by Lenin lacked essential checks and balances, leaving the system open to abuse by ruthless politicians such as Stalin. In this view, Lenin's death left a power vacuum which allowed the most brutal of his successors to successfully gain power through manipulation and intrigue. The historians who support discontinuity theory claim that Leninism and Stalinism were two opposing ideologies. They point out that Lenin’s style of politics was much more flexible than that of Stalin, who introduced a totally “orthodox” regime. According to them, Lenin was head of a revolutionary proletariat dictatorship, and Stalin imposed his own totalitarian one. They claim that Lenin wanted to minimize the influence of the state and called for the “withering away” of the worker’s state as soon as possible after the revolution, while Stalin expanded the power of the state until it was dominating every aspect of Soviet life. In addition, proponents of the discontinuity theory hold that Lenin always wanted to keep a revolutionary form of democracy, and that his party originated from a multi-party state and contained many different groups and factions under his rule. Lenin viewed the ban on factions and opposition parties only as a preliminary measure, and a distortion of the Communist ideology. 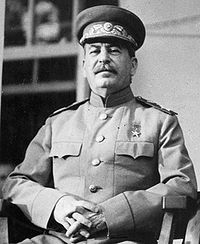 Stalin misused the ban to attack his personal and political enemies and create a monolithic organization under his complete control. In his authoritative biography of Lenin, however, Robert Service argues against the portrayal of the Bolshevik/communist party under Lenin as having been extremely democratic. Proponents of the discontinuity approach also emphasize that Lenin’s terror organization differed both in quantity and quality from Stalin’s organization. Lenin exiled his defeated opponents and never attempted to kill his party comrades, and the number of people affected by his terror network never reached the massive scale it did under Stalin. Furthermore, Lenin ended the Red terror and restricted the Cheka’s powers after the civil war. Lenin had introduced the NEP in place of the old war communism, steering a moderate course in economic policies, which was very different from Stalin’s program of rapid and ruthless state-run industrialization. Between December 1922 and January 1923 Lenin looked for the support of Trotsky against Stalin and his associates. He opposed Stalin’s views on the state monopoly of foreign trade and especially his nationality policies in Georgia. ↑ "Rise of Stalin" History of Russia. Retrieved September 30, 2014. ↑ Andrei N. Lankov, Crisis in North Korea: The Failure of De-Stalinization, 1956, Honolulu: Hawaii University Press, 2004. Barnett, Vincent. "Understanding Stalinism: The 'Orwellian Discrepancy' and the 'Rational Choice Dictator'" Europe-Asia Studies, 58(3) (May 2006). Deutscher, Isaak. Stalin: A Political Biography. Dietz, 1990. Souvarine, Boris. Stalin: A Critical Survey of Bolshevism. Alliance Book, 1939. Retrieved April 9, 2008. All links retrieved September 30, 2014. Stalinism: Its Origins & Future. Martin Thomas - Stalinism and state capitalism. Guide to Philosophy on the Internet. This page was last modified on 30 September 2014, at 21:30.